These are serious contenders for the best monitors in their price range, and perhaps even beyond. Great tonal balance and imaging. Excellent build quality. Very good pre and post purchase customer service and a very generous upgrade path for current owners. When we reviewed the Egg 150s in back in 2012 they achieved a near perfect score. The innovative design of the loudspeakers' monocoque shells, choice of drivers and amplification system seamlessly fitted together to provide a superb tonal balance and highly detailed imaging. MunroSonic has since had some issues with the Egg however. Struggles with quality control at the Chinese end of the manufacturing chain began to adversely affect supply. There were also a few minor issues in the amplifier, so the decision was taken to go back to the drawing board, switch to all UK manufacturing and relaunch. "The original bi-amped concept has been kept but the new unit is not only better, and to our eyes more appealing, but also far more consistent"
The loudspeakers themselves are pretty much as they were. The shells are still moulded from the same materials and that shape is specifically designed to reduce diffraction and internal resonance. While the drivers are the same units, manufacturing tolerances are even tighter than before, so there is even less variation from unit to unit. The unique LED 'sweet spot' guide beams, switchable from the amplifier, are still there to assist in perfect placement and the adjustable bases allow for accurate vertical alignment. Connection to the amplifier is by two 3m cables using 'speakon' connectors. It's really in the amplification section where the big changes have been made. Where the previous incarnation of the 150s fell down was in the quality control of this part of the system, so, with the decision taken to move all manufacturing back to the UK, came a complete re-design of the amplifier. The original unit did have a mid-range control but it was so subtle as to be almost ineffective and there was a very tiny noise imbalance left to right. So, the PCB was completely re-designed and the original metal case handed over to an Italian design company for an overhaul. The original bi-amped concept has been kept but the new unit is not only better, and to our eyes more appealing, but also far more consistent. The PCB itself is made by a company specialising in military electronics so the whole thing is beautifully constructed and remarkably consistent. The case is also of a higher quality with recessed knobs and a far more solid front panel. As with its predecessor, the amplifier has a headphone output but this has also been upgraded to a class A system and sounds excellent. You would expect to pay a good £300 just for a free-standing unit of this quality. As already stated, the speakers connect using the provided cables and there are two sets of inputs. The main inputs are on XLRs while the aux input is a pair of gold-plated phono sockets. These have separate level controls on the front panel. There is a two-position input selector switch and a three- position mid-range switch. The re-design of this particular control means that, if you are used to the kind of mid-range lift associated with the likes of NS-10s, then you can have it; or perhaps you're more used to the mid scoop of something like a Genelec, in which case you can get that too. In relation to the original Eggs, the biggest difference is in the bass. While the originals were certainly not bass light these sound fuller and more defined. From the intricate subtleties of a Jazz quintet to Rock and Electronic music, the stereo imaging is superb and the incredible tonal balance means that EQing in any area of the spectrum is immediately evident and defined. This is certainly one of the best sounding pairs of speakers this writer has ever tried. 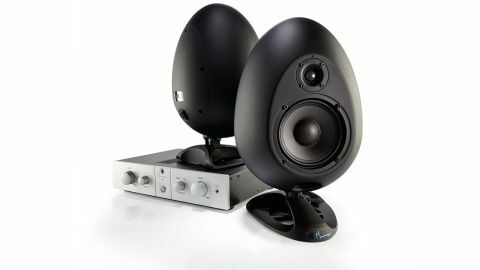 If you want to demo them in your studio, you can do so for free by taking advantage of MunroSonic's 7-day loan service.